As rupee 500 and rupee 1,000 notes stand banned in India, the nation is hopping crazy over prime minister Narendra Modi’s latest move to rout out the malice of black money. Bollywood which at one time was one of the biggest facilitator of black money, with producers dealing a lot in cash, stands in support of the PM today. With corporate culture having entered the film industry, the tables have long turned in the favour of clean money in Bollywood. 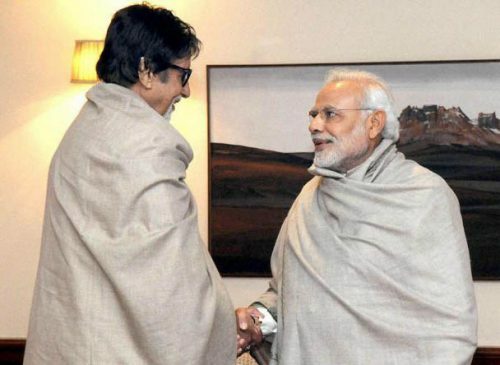 One of Modi’s strongest supporter, megastar Amitabh Bachchan decided to base his tweet on his recently released film Pink. “The new 2000 rs note is PINK in colour … the PINK effect ..! !,” said Big B. “A welcome bold & courageous step by PM Modiji towards nation building. Each 1 of us shld cooperate in d larger interest of d nation BlackMoney,” wrote actress Anushka Sharma. “Sau sunar ki, ek lohar ki,” quipped so-called bhakt and actor Anupam Kher. Singer Sonu Nigam too was floored by the development. “Hats Off Sir @narendramodi … Proud to have you as our Prime Minister. Heartfelt Respects and Love,” he wrote. All the three Khans; Shah Rukh Khan, Salman Khan and Aamir Khan refrained from tweeting on the day of the development, but are expected to support the move soon. Firebrand Priyanka Jagga needs to quickly re-enter the BiggBoss House as a WildCard and inform all the housemates that all their bundles of cash lying in their lockers would be redundant by the time they come out of the show. This move itself will cause the greatest tumultuous drama on the show and its TRPs will hit the roof. BiggBoss10 BB10,” tweeted Bollywood PR guru Dale Bhagwagar, considered a specialist with Bigg Boss for having handled the publicity for 20 of its most controversial contestants. Riteish Deshmukh, whose father the late Vilasrao Deshmukh was the Chief Minister in the Congress, which is in opposition to the BJP, supported the move. “Bold move by PM @narendramodi ji as the #1000rs #500rs notes become invalid/redundant. NewIndia,” he tweeted.